I am just getting around to installing the light switches . This is how the finished light switches look at the moment. Later on I plan to change the front plate of this switch to one of the other options such as glass, wood or marble. This is what the above light switch looked like before installation. Standard switches can be used if one uses the method described below. I used a screened alarm cable to connect the KNX binary device known as a universal interface. This voltage is extra low around 3 volts DC. As seen above this is what a typical KNX lighting distribution board looks like. One has a Power Supply (top left) and a programming Interface (next to power supply) . The three actuators (12 way) on separate rows send power directly to the rooms or other devices such as towel heaters. Functionality such as timers, last state before power failure, purging (automatically switching on pumps/valves to ensure they do not stall) etc is already built into the KNX technology. LED Housings before I assembled the LED and its LED Driver. This is one type of LED Driver I have used to power each LED. Typically when one buys an LED they have already tried to fit all the electronics contained in the above unit in the lamp one buys . This is one reason why led lamps do not always live up to their expected life time of 50,000 hours. The majority of LED failures are due to heat stress. I am using 9 watt LED in the housings shown above and the Power supply is a separate unit. For lower power LEDs one requires less electronics. I have been looking for a simple cost efficient way of installing blinds on some of the bedroom windows. The windows are nearly 3 metres above the ground and 2.1 metres wide. I did not want a manual method of using long cords hanging down to the floor level because of the child safety risk. The blinds only purpose is to block out summer light at night. There are solutions for the outside which are the norm across Europe but these I deem too complex. These same units have multiple purposes such as security, provide darkness and reducing solar gain. The simplest to maintain I feel are shown below from one of the following suppliers . The units will not be used every day (unnecessary in the winter) so they should be reliable. The prices start at around 80 Euro. For the above I have installed cables to supply power rather than use the solar option. These cables can then be fed from one central point with the appropriate voltage from say a battery charged by solar. I also installed the wiring so that a manual switch can be installed rather than using a mobile phone. What will be important for the above is to find a blind mechanism that is smooth and reliable. Some of the online prices for these appear to be around €90 for 2.1 meter wide and 1 meter long. If one wants to go the traditional way then the video below may be helpful. When I priced internal motorised blinds in Ireland they were costing around €400 each. I am including an Ethernet cable connection to each room. The reason for this is that it provides a more robust signal and has a higher data rate compared to Wifi for internet use. I also ran an Ethernet cable to the TV and Stereo location as these technologies merge with the internet . In order to install an Ethernet network one needs to select a central point to locate the switch/router and run a separate cable to each room from this position. It only took 3 or 4 hours to do this. The cost of the cable is low approximately €20 for 100 metres . The best value I came across is 305 meters for €49 (www.freetv.ie). There are a few types of Ethernet cable such as CAT5 and CAT6 and combinations of these. I installed the CAT6 un-screened cable as it offers a better performance than CAT5 and maintains the same type of connections that are used today. A location worth running the cable to is the kitchen (never know what a kitchen appliance will do next). For the TV (Terrestrial) one needs a 75 ohm cable and the satellite one requires a 75 ohm cable to match the LNB. The satellite connection needs to be kept short for the optimum signal ( I was told to keep it to less than 10 metres ). The TV 75 ohm cable can be any length. Be aware that there are low quality and good quality cables of the same type. One also needs to ensure that the 75 ohm cable bends on the cable are not below the manufacturers specification as this will increase the signal loss. A good cable manufacturer will state the minimum size of a bend. A simple wiring diagram of the data cable routes are shown below. As the cable is very cheap it is a good idea also to install one near the front door and distribution board. Below is my wiring diagram to ensure I do not miss something. Having recently come across a best practice guide for Electrical installations and their effect on the fire performance of buildings I have decided to change the approach to the fire/acoustic isolation between rooms. 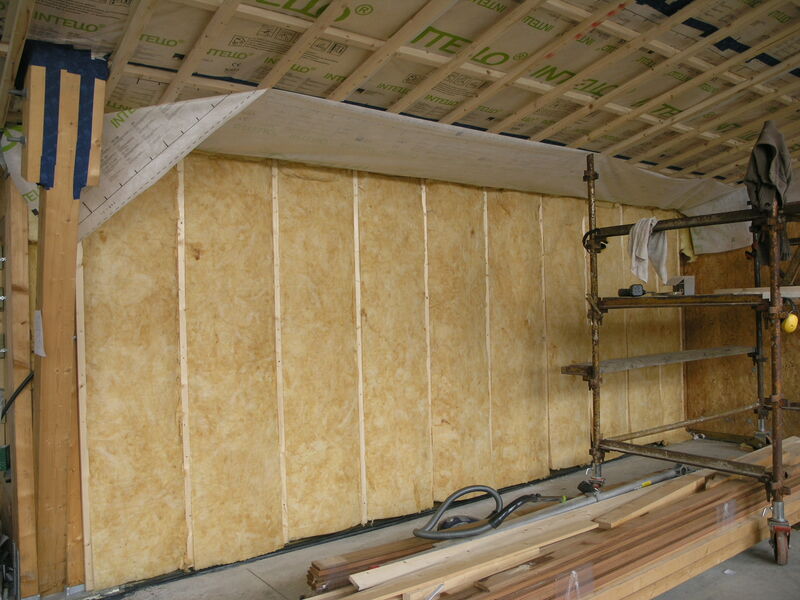 I will now install Rockwool flexi 50mm in the 100mm partition walls and Rockwool flexi 100mm in the 140mm partition walls . 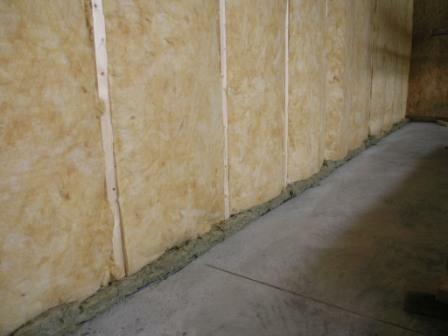 From an acoustic perspective I was advised that it is better to install the Rockwool in the centre of the partitions rather than touching one or other side of the plasterboard as this limits the sound transfer. The Electrical Safety Council best practice guide deals with Electrical installations and their impact on the fire performance of Domestic premises at this link when one is building a home. A summary is as follows but the full document is worth reading for any self builder. The need to prevent fire from passing through holes in all elements whether solid or lightweight is addressed. Electrical Equipment is identified that has a direct and significant influence on the fire performance of an element. 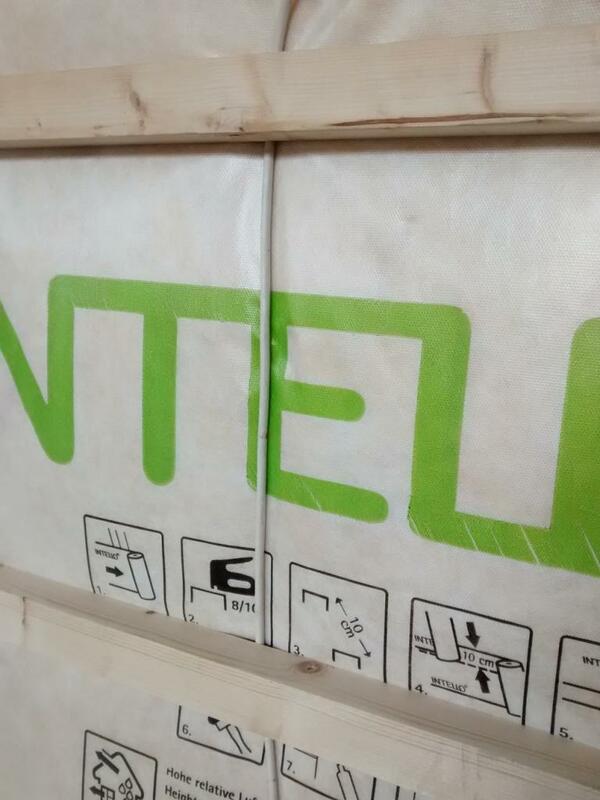 Partial Penetrations –those that reduce the fire performance of part of the wall/ceiling or floor. Full Penetrations-such as ducts and fans that go through both elements of a wall/ceiling/floor. In a previous blog I discussed the advantage of using KNX for the lighting control only. Some of the KNX control options are expensive so in order to keep things simple and affordable I have decided to use the following devices to control the lighting. As most of the LED lights are using around 5 Watts of power I will also eliminate the dimming functions and ensure that the layout of the lights in the ceiling can be switched on separate circuits in the larger rooms (a simple form of dimming in a way). The hardware required will be a KNX binary input /output device with 12 inputs/outputs to connect to standard light switches. The advantage is that the cost is reduced by not using a special KNX light switch. A single KNX switch can cost up to €100 while a simple mechanical switch that costs €2 or €4 approximately can carry out most of the primary switching functions and is designed to work on the KNX system. My preference and research on the best value for money is a product made by ABB called an Universal Interface US/U 12.2 . Expect to pay around €120 for one of these which has 12 inputs/outputs (Equates to €12 euro per room). It can also carry out dimming control with a suitable KNX actuator (device that switches the power from a central distribution location). There are numerous other functions built in that are relevant to lighting and indication control. The plan is to mount one of these Universal Interfaces in 4 different areas in the house (The size of one of these units is approximately 52mm in diameter) . A maximum of 12 light switches will connect to this Universal Interface. It is recommended to keep the cable feeding the light switches to a maximum length of 10 meters (although I have found it works reliably up to 100 meters). I will be using screened alarm cable (6 core) to each of the switches. In this way I plan to leave a spare core for each switch so that other functions can be applied in the future without re-decorating. I will be using a push to make light switch as this allows one to use the same pair of cables for two way control and optimise the use of the cores in the cable. For the switch actuator (relay control of the lights) one can select the equivalent 12 channel KNX actuator. If one goes to the above web site or other KNX web sites and enters EIB KNX switch actuator 12-fold, SA.12.16 in the search engine one will find these units. Expect to pay around €230 for one. 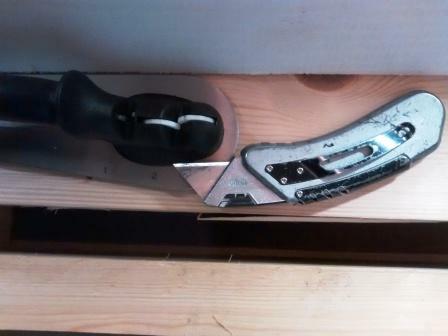 If one goes to http://www.eibmarket.com they have one for around €239 including VAT. This works out at a cost of around €20 per room along with the savings in wiring and flexibility in the future as discussed in the previous blog. If one wants to dim LED lights one needs to research a suitable dimmer for the LED light. There are different technologies used to dim LED lights so one needs to establish which LED lights to use first before committing to purchasing a dimming function. I am aware of two types such as leading edge and trailing edge controls for dimming. As I will not be dimming the low wattage lights a simple actuator is all that is required. 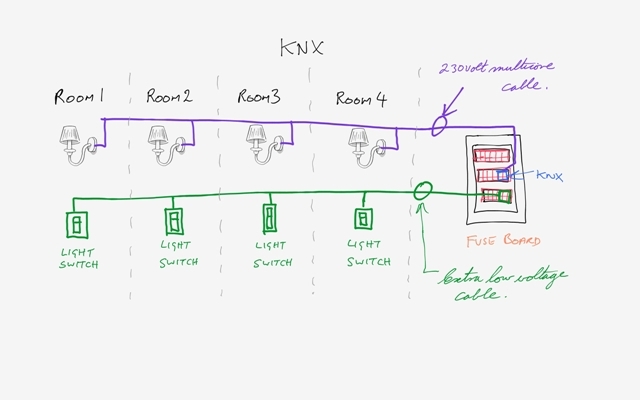 For the electrical wiring I plan to use a central control system called KNX for the lighting ( I will build in the flexibility to control power outlets from the switch positions in the future) . What this means is that the power for the lights will come from a central fuse/distribution board and the switches for the lighting will be independently controlled by an extra low voltage. to reduce the impact of interfering with the airtight envelope (as the cable is similar to alarm cable thus less wiring will need to be installed and more room functions can be carried out with one cable). Extra capacity can easily be included in each switch position in order to allow for wiring changes in the future. (If a new light needs to be controlled from an existing switch no modification of the wiring, internal wall/ceiling structure or room re-decoration needs to take place). Because the voltage is very low and DC (Direct Current) it will reduce electrical and magnetic fields and minimize the use of 230 volts AC (Alternating Current) from a health perspective. When leaving the house one switch can be configured to turn off all the lights or turn on essential lights. I became a KNX partner in order to purchase the software to design and develop a prototype before the build. There are other building control systems and smart systems but the KNX system is a world standard and an open standard for commercial and domestic building control. Most of the large electrical companies manufacture KNX products. While the KNX system can manage the most complex building and smart home systems I will be using the most basic functions of the KNX system in order to keep costs under control and make use of the benefits as outlined above. 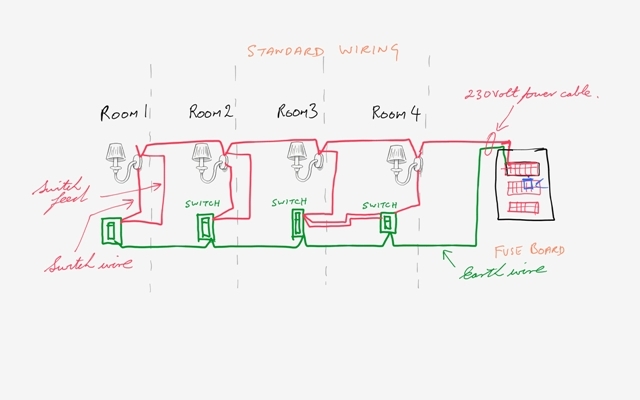 The sketch shown below might help to explain the difference between a standard wiring system and a KNX system. A few notes that may be helpful to the self builder when planning the services such as sink waste, cold/hot water feeds, toilet services. 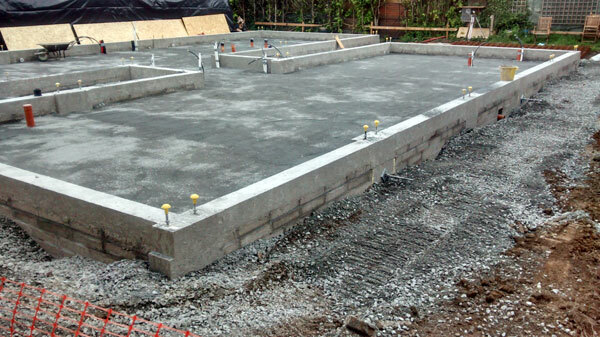 The layout of the foundation services necessitates the early planning of bathroom layouts and even the choice of toilets and shower outlets before the floor slab is poured. 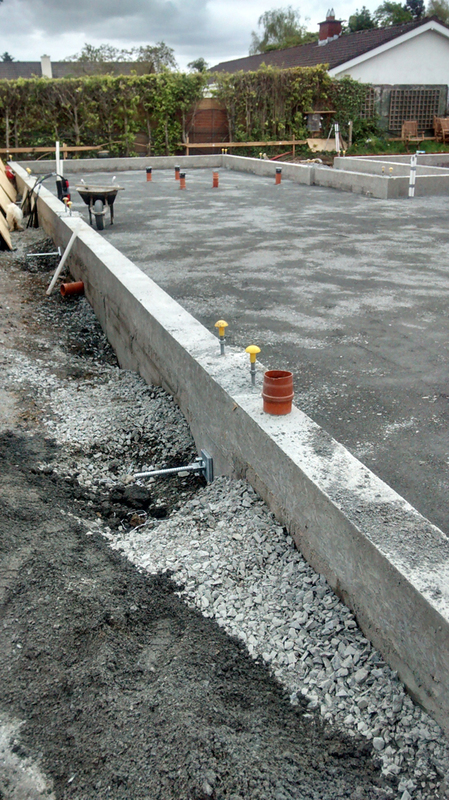 Foundation Services-White pipes are electrical services. We visited a local bathroom showroom and we were informed that there are a few different types of toilet systems and they require a different pipe outlet location in the floor to ensure that they will fit. One has also to be sure that the layout of the bathrooms and toilets are what you want before the slab is poured. For the shower outlets one has to decide between the use of trays or a walk in that is tiled flush with the floor or other finish. This will necessitate different floor slab preparations. Another factor to keep in mind is that showers or sinks that are lightly used may dry out in the pipe trap resulting in unwelcome smells. I am trying to locate a unit with a larger water trap. For sink outlets waste pipes it is beneficial to have these mounted in the walls so that different arrangements can be facilitated later on. 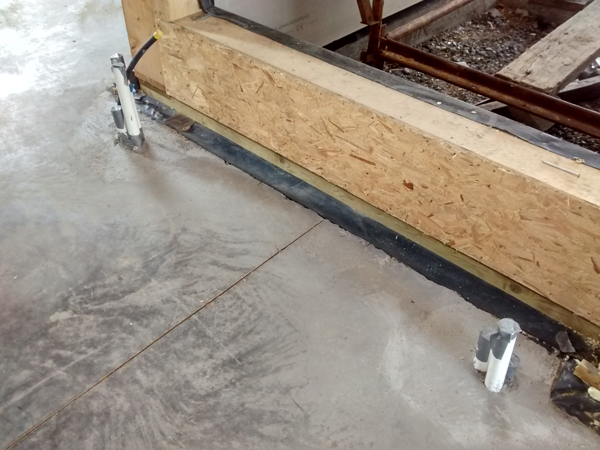 This necessitates the slab pipework being brought up in the centre of the partition or in the service cavity. I have tried to keep all these inside the airtight membrane. These need a special mention as one has to consider a duct for power cables if a kitchen island is used, water drain outlets for dishwasher etc and a cold water feed for a sink. It is practical to have the water main feed coming into the kitchen first before branching to other locations around the house. (This is more than likely the place one expects to switch the supply on/off) . 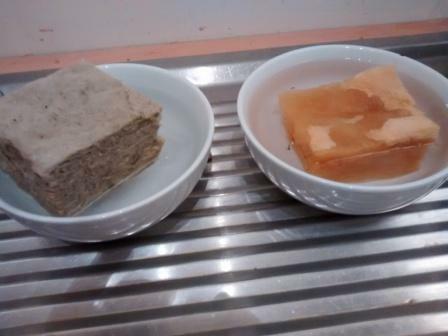 Consider the grease trap outlet location also as they are substantial in size. In relation to electrical cables entering and leaving the house one needs to plan for cable ducts to garden lighting, main electrical supply (using special red ducting), rainwater harvesting cables, power for central vacuum unit if mounted outside the house, telephone line, broadband cables, power for outside shed if applicable, control wiring for services in plant room if situated outside, CCTV/alarm cables if applicable or a plan for these. I feel it is better to put the ducts in now as any unplanned cable changes in the future will affect the fabric of the building. 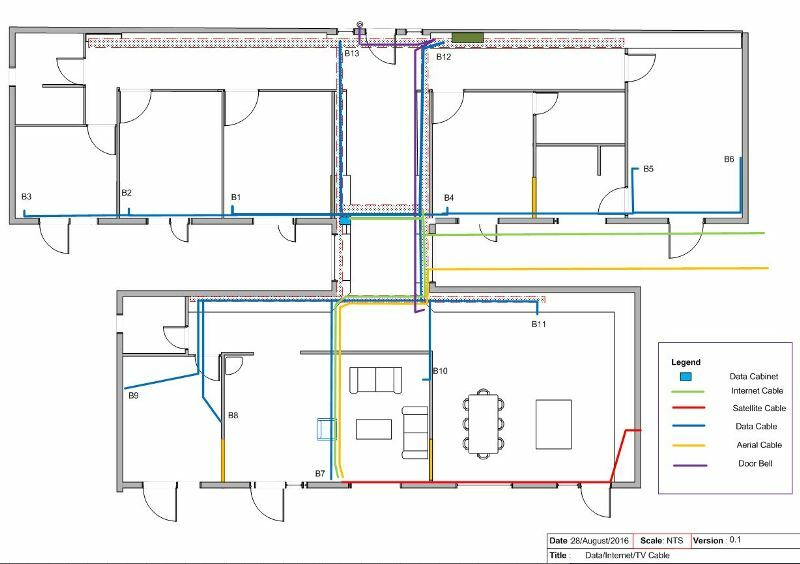 My preference was to use a single 40mm duct for each cable with large sweeping bends for the electrical services. I feel it will be easier to ensure an airtight/rodent/insect seal with heat-shrink tubing on each duct. Separate 40mm ducts for each electrical service. The HRV unit may also need a water condensation drip outlet. For this I plan to use a half inch heavy duty pipe that will go outside rather than plumbing it into the sewerage outlet. Because we plan to use a gravity based system the garden taps will be fed from inside the house using a 1/2 inch or 1/4 inch pipe installed in the foundation. One will feed either side of the garden. 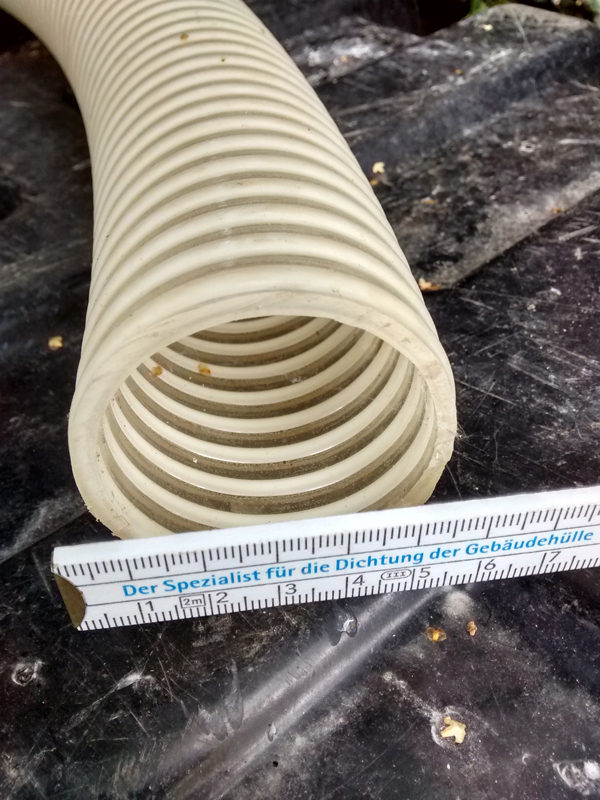 If this is being installed a special flexible PVC duct is required if the unit is situated outside the house.